Category: Ancient Wisdom Tags: astrology, birth chart, history, Illustrated, Photography, zodiac sign. What is the effect of each of the planets on your zodiac sign? What is the influence of the 12 ‘houses’? What are ‘aspects’ and how do they relate to your birth chart? 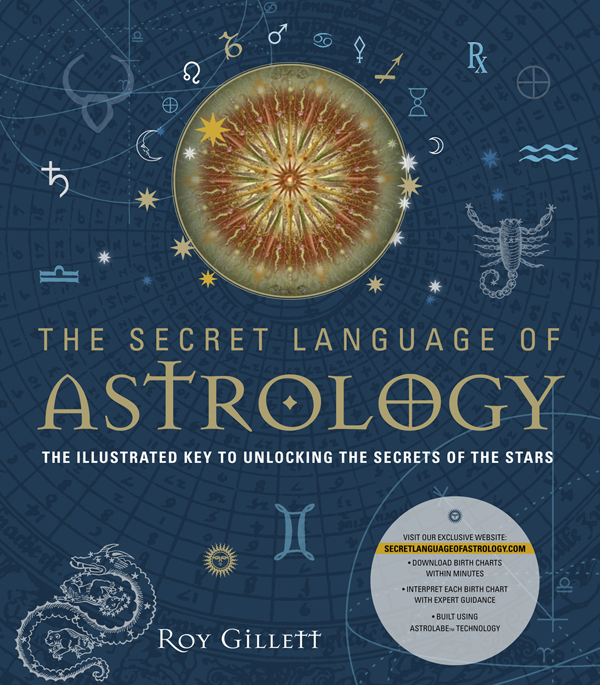 In this unique book and weblink package, renowned astrologer Roy Gillett uncovers the hidden layers of astrology to explain the complex interplay of influences that shape our character. The Secret Language of Astrology gives access to an Astrolable™ website created exclusively for the book, enabling you to create a detailed birth chart for yourself, or for family or friends, within seconds. A historical introduction traces the history of astrology from antiquity to the present day. The second part of the book, ‘The Elements of Astrology’, looks at the planets, the zodiac signs, the twelve houses and the aspects. The emphasis throughout is on equipping the reader to analyse their birth chart, by examining the influences and showing how they combine to shape our lives and our potential for growth. The third part, ‘Putting the Pieces Together’, shows you how to apply all this information when reading a full birth chart. Thoroughly practical, but with a wealth of historical and cultural detail, as well as superb illustrations and photographs, this is a landmark in astrological publishing.